There are books we read without a purpose. We grab them when we want a leisure activity that wouldn’t burden us with dilemmas about the choices we make in life. There are also powerful books that transform something within us. Some authors manage to change the way we understand the world and ourselves. For some people, the inspiration is in the Scriptures, while others prefer modern psychology in the form of “how to” books. Others find deep meaning in a seemingly simple story, such as The Little Prince or Jonathan Livingston Seagull. 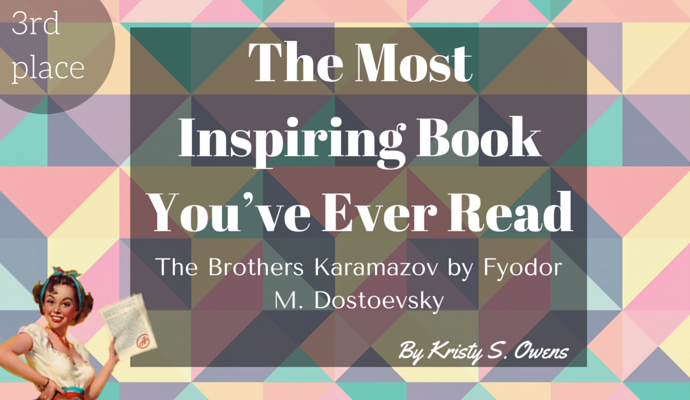 The book that shifted me from the zone of comfort was The Brothers Karamazov by Dostoevsky. No matter how many times I go back to it, I always discover new inspiration that helps me trace my entire life in the direction I believe it is supposed to go. This book makes me seek for answers deep within me. The questions Dostoevsky imposes are mostly based on belief and free will, which are both a freedom and a punishment. In my opinion, this writer was one of the greatest researchers of the human soul that ever existed. In The Brothers Karamazov, Dostoevsky gave us the ideal of a beautiful, positive person through the character of Father Zosima, opposed against the character of the bitter rationalist Ivan Karamazov. Between these two “absolute” characters, I could recognize a plethora of personalities with their own internal struggles. There is hardly a human characteristic that Dostoevsky did not address in this book. For Nietzsche, this author was the only psychologist from whom he had anything to learn. In psychology, the personality is defined as “the integrated and dynamic organization of the physical, mental, moral, and social qualities of the individual that manifests itself upon others in social life”. Dostoevsky managed to capture different combinations of these factors. Thus, this novel is more than literature to me; it is psychology and philosophy in actu. The world of twisted or naive aristocrats and servants, pious saints and atheists, criminals and sufferers, and obsessive idealists and rigid conformists, reaches readers regardless of the time, territory, religion, and cultural turmoil. Although the patricide, which is in the middle of the action, makes the narration intriguing and successful, the value of this book is in the thought-provoking parable The Grand Inquisitor, as well as in the opposing views of Ivan on one side, and the elder Zosima and Alyosha Karamazov on the other. When I first read The Brothers Karamazov, I was shocked by the intellectual atheism of Ivan Karamazov and his legend of the grand inquisitor, which raised many questions about everything I stood for. This part of the book made me reconsider my beliefs, mainly because it did not offer definitive answers; it left the discussion open for pondering in the deepest layers of my personality. The hesitation Dostoevsky leaves me with always leads to learning more about myself. Through this part of the book, the author performs a radical, unprecedented attack on Christianity, which I experienced even more intensively than the one in Nietzsche’s Antichrist. As I faced Ivan’s harsh critiques of religion and unforced satire of people’s beliefs, I spent days in inner struggle, pulling parallels with real-life events. Finally, I was able to see the big picture and come to realization. Although Dostoevsky presents both atheism and spirituality through this book, he is never an explicit apologist of any side. This book imposed one question, which I managed to answer after a long, honest dialogue with myself: “Do I believe?” However, there was another answer I needed too: “Did Dostoevsky believe?” Like all great writers, he is not acting with the thesis “these are the good guys, and these are the bad ones”. Throughout his analysis of humanity, he managed to present his own tormented mind that was looking for solutions. The writer was not trying to convince us of something; he took the role of a “realist in the higher sense”. That’s why his novels are polyphonic. The characters come on stage to tell their story, and the reader remains in charge of the side he stands for. Dostoevsky presents the man in anger and distress; in a fiery whirlwind of passion and temptations. For me, the most disturbing part of this book was Dmitry’s tormented spirit, which reveals the outback in people’s soul. I understood this character as a masochistic archetype, running towards his own downfall. When someone loses touch with himself, the terrible face of nothingness pushes him deeper. Throughout the novel, I saw Dmitry Karamazov show his great power, when he finally found where to direct it. After reading The Brothers Karamazov, I realized that the characters of the Elder Zosima and Alyosha Karamazov inspired me to be a better person, in the spirit and true essence of Christianity. I started reading the Bible after I finished this book and resolved my own inner struggle. Dostoevsky’s characters present the best and worst features of humanity. I don’t know if he ever found his answers, but I’m grateful that he helped me find my own. Not many readers would choose Father Zosima as their favorite character from the book, mainly because they consider him to be idealistic. Nevertheless, I saw him as an inspiring man, who showed me how to remain strong through silent resistance against everything that’s wrong in our world. Novel ‘1984' by George Orwell – Dystopia or Possible Reality?